Save important memories when family & friends are together. 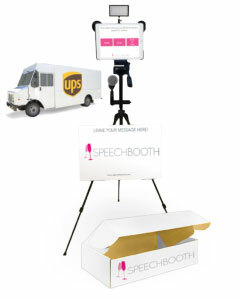 The Video Booth In A Box. Guests Leave Video Messages Easily. The video booth in a box. Guests leave video messages Easily. This is your video keepsake. Messages from friends & family are edited into a lasting remembrance. The final edited videos will become memento to cherish for years to come. The stories that matter told by friends and loved ones. Order online. Sets up in minutes. Includes return shipping. Videos are professionally edited in 30 days. Purchase & schedule rental online. Everything ships to your door. For the duration of your event. Arrives 2-3 days in advance. Every video message, crafted into a memorable keepsake. Set to music. The best moments, hand-picked by our editors. Appropriate for sharing. And other short-notice events less than 1 month away. Booking in less than 30 days. We've Got Answers. We're here to help! Feel free to tell us more.